All transactions are safe and secure with a reliable history in online purchasing behind each of our associates. Buy the I Want to be Formal, But I'm Here to Party t-shirt to own Talladega Nights clothing and merchandise. 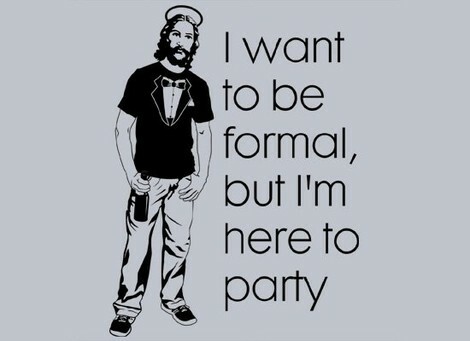 The front of this tee features the memorable quote from Talladega Nights, "I want to be formal, but I'm here to party." Cal Naughton, Jr. (John C. Reilly) delivers this quote when he is describing the personality of Jesus. This Talladega Nights t-shirt is also available in grey or as a ringer. It is the perfect piece of apparel to wear to the next party on your schedule. In addition to the I Want to be Formal, But I'm Here to Party tee above, browse the Talladega Nights Clothing Gallery for more apparel like men's and women's clothes, kids shirts or hoodies.